A cast bronze wall plate depicting an Australian Light Horse Trooper with three horses, commemorates approximately 140,000 horses (only one of which was allowed back into Australia) that served in the Desert Campaign in World War One. 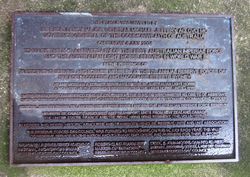 Additional plaques were unveiled in 2004 to mark the 90th anniversary of the First Australian Imperial Force and in 2007 to mark the 90th anniversary of the Charge at Beersheba. In March 1916 the ANZAC Mounted Division (1st, 2nd and 3rd Light Horse Brigades and New Zealand Mounted Rifles Brigade) was formed in Egypt under the command of Major General [later Lieutenant-General Sir] Harry G. Chauvel. In August, as part of the British and allied forces, the Division defeated a Turkish advance to Romani, and forced the enemy back to the line Gaza-Beersheba. During 1917 the Division was involved in the initial battles for Gaza and in the capture of Beersheba, where the Light Horse, armed only with rifles and bayonets, acted as cavalry. In August the Desert Mounted Corps was formed, consisting of the ANZAC Mounted Division (1st, 2nd Light Horse and New Zealand Brigades), Australian Mounted Division (3rd, 4th Light Horse and 5th Yeomanry Brigades) and the Yeomanry Division. A bronze plaque in the wall near the gates to the Botanic Gardens was unveiled by lady Chauvel. It commemorates the horses of the Desert Mounted Corps in Palestine during World War 1. 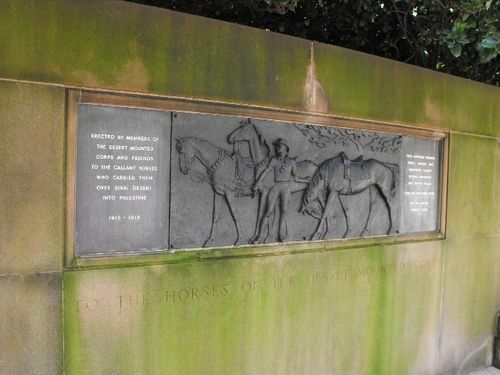 Major General Richardson, chairman of the Light Horse committee, said the plaque would remind future generations of the debt of gratitude they owed to Australian horses used by one of the greatest cavalry forces in history. "The feats of arms of the Desert Camel Corps in Palestine," General Richardson said, " would never have been accomplished without the qualities of endurance which these animals evidenced in the famous campaign." Evening Advocate (Innisfail, Qld), 5 May 1950. In The Presence Of Participating Serving And Former Members Of The 7th Annual Reserve Forces Day Parade In College And Macquarie Streets Sydney. Members Of Cavalry, Armoured And Transport Units From New Zealand, Canada, The United States, France And The Royal Hong Kong Regiment (The Volunteers) 96 Horses And Riders, Historic Armoured And Transport Vehicles, Reserve Units And Unit Association. The Reserve Forces Day Council Was Formed To Recognise, On The 1st July Each Year, The Value Of Reserve Service To The Nation And To Thank Employers And Partners For Their Support. They Suffered Wounds Thirst, Hunger And Weariness Almost Beyond Endurance But Never Failed. 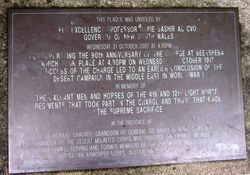 This Plaque Was Unveiled By Her Excellency Professor Marie Bashir AC CVO Governor Of New South Wales Wednesday 31 October 2007 At 4.30pm Commemorating The 90th Anniversary Of The Charge At Beersheba Which Took Place At 4.30 pm On Wednesday 31 October 1917. In Memory Of The Gallant Men And Horses Of The 4th And 12th Light Horse Regiments That Took Part In The Charge And Those That Made The Supreme Sacrifice. In The Presence Of Dr Richard Chauvel, Grandson Of General Harry Chauvel GCMG KCB Commander Of The Desert Mounted Corps Who ordered The Charge, Members Of The Chauvel Family. Serving And Former Members Of The Pre World War II Light Horse, Royal Australian Armoured Corps, Australian Defence Forces And Friends.